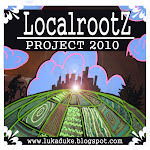 Localrootz Project: Raising Beds and Planting Heirlooms. 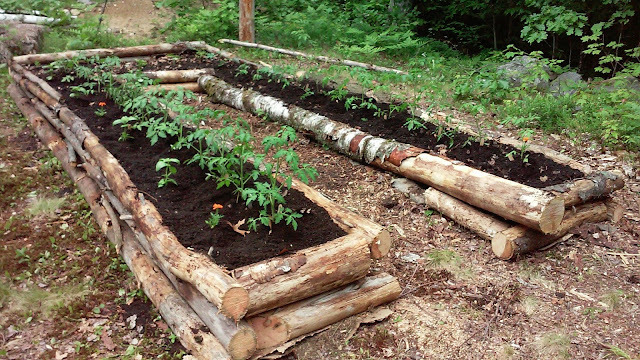 Raising Beds and Planting Heirlooms. So after a long winter of contemplating what went right and what needed improvement with the first growing season at the Localrootz Homestead, a glaring issue was where to plant our tomatoes. 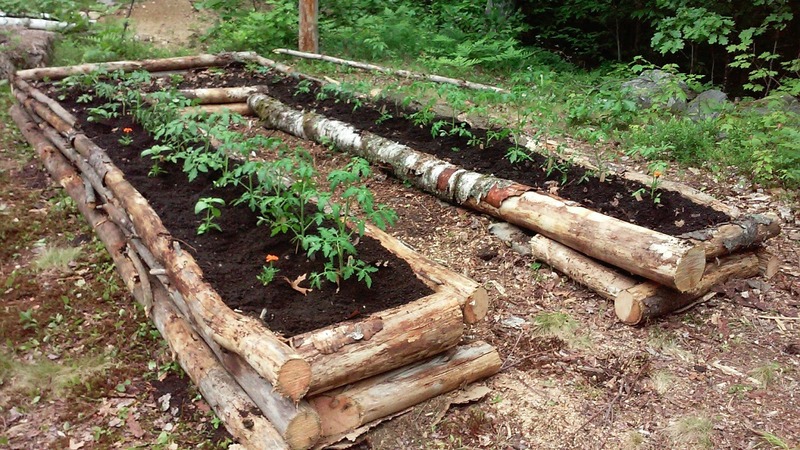 Last year I made the mistake with planting the 10-15 tomatoes plants in the middle bed of the the raised bed trio, using classic tomato cages and and a makeshift trellis system of wooden stakes and twine. After a few big thunderstorms it turned into such a mess and the placement of the tomatoes lead to a lot of shade space that kept some of our plantings from being as productive as we had hoped them to be. In comes this springs project of building a separate bed altogether. The first step was dropping a couple of maple trees that were shading the new location as I wrote about in a previous post. After that I spent a couple weeks taking a little time every morning before work to cut back the brush around the location of the new bed. 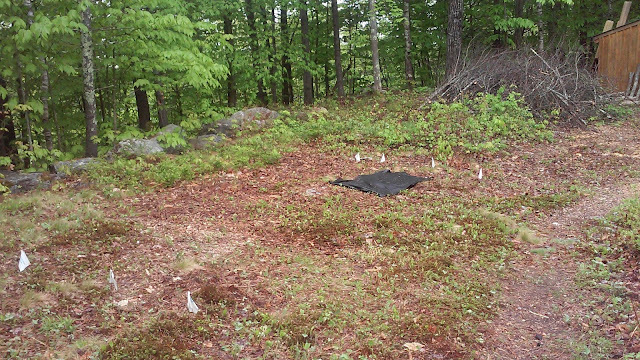 Once things were under control I flagged out a couple 2 1/2' x 20' sections and contemplated my next step. We had good luck last year building up the depth of the beds to 24" or more and had no issues with the suppressed underbrush growing up through the compost layer. 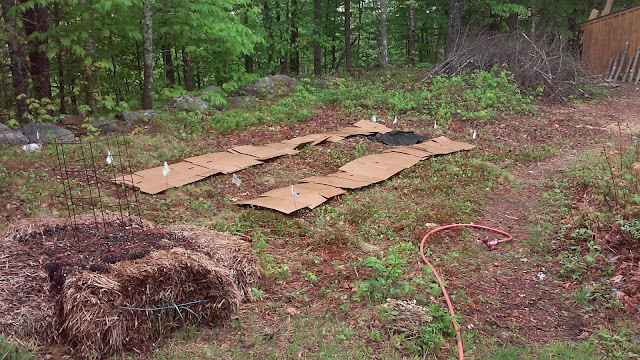 I chose to roll the dice and forgo the pricey and unnatural layer of weedblocker on this project. Instead I started with overlapping layers of cardboard as a base layer for the construction. On top of that I started piling up a couple weeks worth of lawn trimmings. As the layout came together I started sourcing some good lengths of blow down timbers from the surrounding woods, which with a little bit of searching always proves a simple task. After felling a large rotting birch tree a few hundred yards from the new raised bed site, I did however have to call in a helping hand to maneuver what proved to be a pretty hefty piece of lumber. As the framework started taking form with timbers and grass clippings I also started included some layers of shredded leaves from an afternoon mowing session along the surrounding forest. This provided ample volumes that made spreading 6-12" of mulch and clippings a pretty easy task. 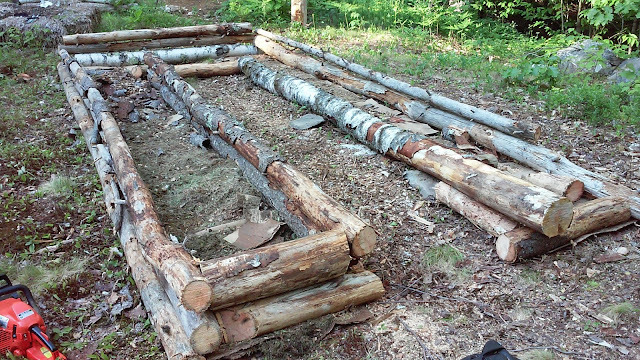 As the layers increased I added more timbers till I was around 18-24" high. It took some grunt work but in the end I was pretty happy with the framework and now it was time to uncover the compost bin and see if I had enough left from last year to fill the new bed. My makeshift winter storage bin worked great for easy access to the black gold as I spent a good portion of the day shoveling it into the wheelbarrow and then spreading it amongst the raised beds. 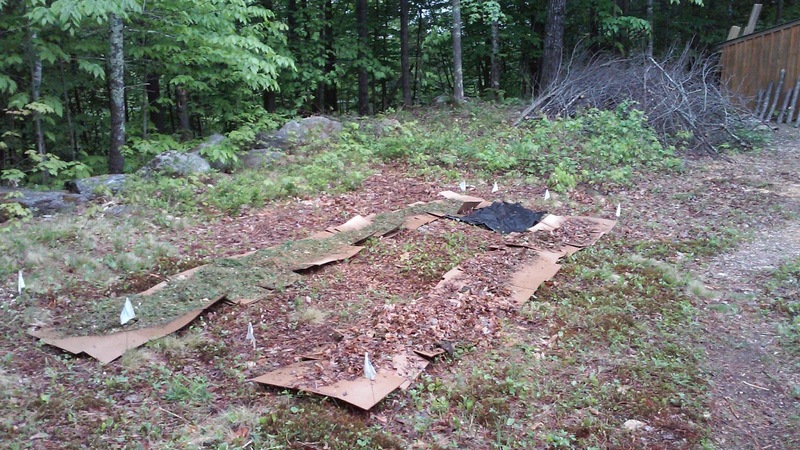 With the compost I piled on another 8-12" on top of the base layer of clippings and mulch until I made my way around the U-Bed and had a good base of 18-24" of growing matter in which to plant into ! A few tips on grunt work... having a shovel at each end of the project makes life much easier not having to hold the shovel while pushing the load, its those little things that make a afternoon of lugging load after load a little more manageable. 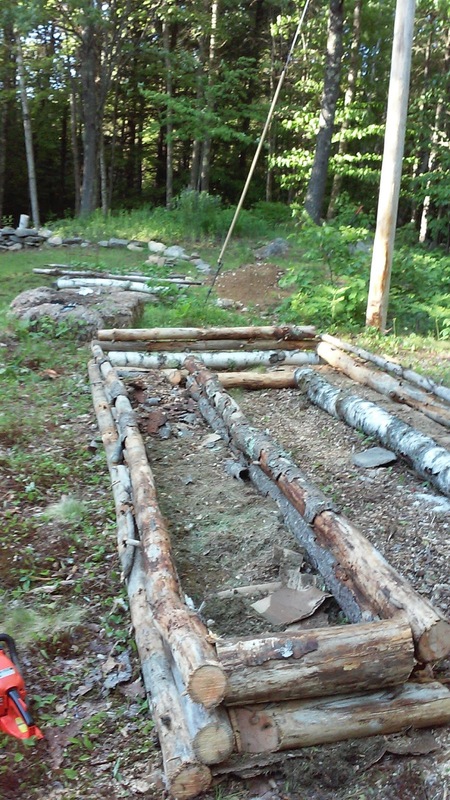 Another trick to the timber frame raised beds is to use pieces of bark to block the inevitable gaps between the timbers keeping the precious compost inside the bed. Luckily I had ample pieces that I collected while splitting our firewood last fall so I was well prepared to get this project finished to completion ! 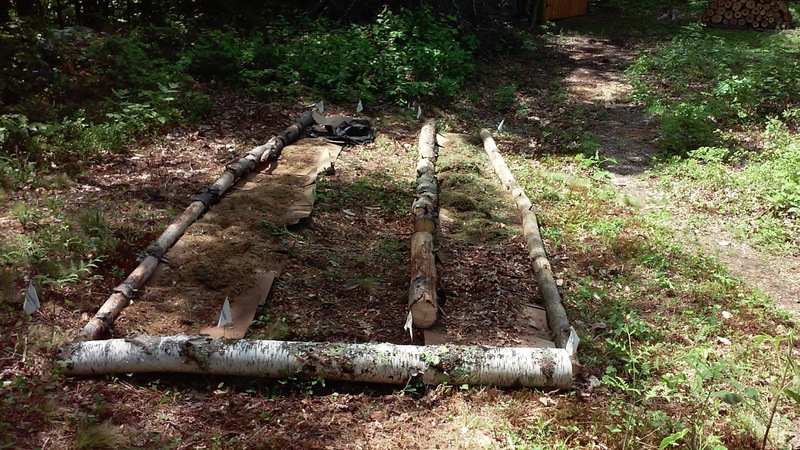 The final length of the beds ended up around 17ft long and I was able to transplant 30 heirloom tomato plants as well as a smattering of basil and marigolds to help ward of some woodland nibblers as I do not have a fence in place at the moment. With 10 different heirloom varieties Im hoping all goes well and we should have ample tomatoes coming our way this summer as the season of juicy ripe homegrown tomatoes grows closer and closer. Valencia, Black Prince, Black Krim, Big Beef, Sungolds, Amish Paste, Speckled Roman, Red Zebra, Black Chocolate, Muskovich. In the next week or two I should have the trellis system Ive been scheming out in my head and on some scraps of paper completed. The goal is to keep things neat and tidy this year and use the old tomato cages from last year for my pepper plants this season ! The plan is to run a center bar down the middle of the two beds and by attaching twine from the center bar to some eye hooks sank into the top outer edge of the timbers. I can then train the vines up the twine and it will create a nice canopy of tomatoes that I can access from the outside and inside edge of the bed. More on that as the tomatoes get used to their new home and I rinse the nutrient drenched soil from my well worked hands.